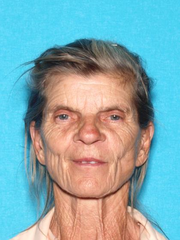 Los Angeles County Sheriff’s Department’s Missing Persons Unit investigators are asking for the public’s help in locating Nancy Jane Rodziczak. 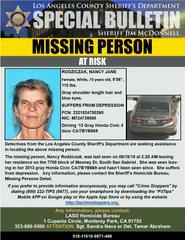 She is a 73 year-old female White who was last seen at her residence on the 7700 block of Mooney Drive, South San Gabriel, on Saturday, August 18, 2018 at approximately 2:20 a.m.
Ms. Rodziczak is described as 5’06” tall, 115 lbs., shoulder length gray hair, and blue eyes. 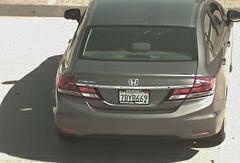 She was driving her 2013 gray Honda Civic CA/7BYB669 and hasn’t been seen since. She suffers from depression. Her loved ones are very concerned and asking for the public’s help in located her.